Produces a permanent, authentic green finish on copper, brass, and bronze. Jax orders are only shipped by UPS ground and cannot be shipped to a P.O. Box. To ensure the best results, clean your metal of all lacquer, oil, grease and wax. JAX manufactures metal cleaners that are optimal for prepping your metal, but there is no one cleaner that will guarantee perfection. Your choice of cleaner depends on what you are trying to remove from your metal. Regardless of what you use to clean your metal, we recommend using Dawn Dishwashing Liquid as the final step before applying the JAX Green Patina. Use a stiff bristle brush and apply the JAX Green Patina directly to the metal. The initial coat is critical. Brush the patina onto the metal until a dull film appears. The appearance of the film indicates that the patina has adhered to, and is reacting on the metal. Additional coats may be applied. Allow each coat to thoroughly air-dry (24 hours) between coats is recommended. 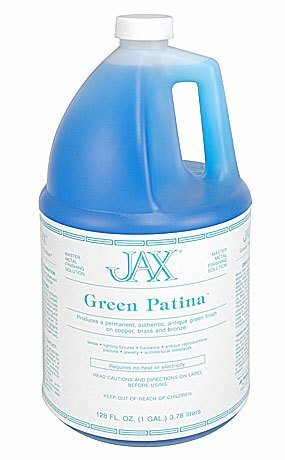 Unlike the JAX Blackeners and Darkeners, the JAX Green Patina does NOT work instantaneously. We do NOT recommend applying JAX Green Patina by dipping your metal into JAX Green Patina. Do NOT dilute the JAX Green Patina. Once you are happy with your finish, you may wax, oil, or lacquer the metal as a final step, although in many cases leaving the metal “unprotected” may be desirable. It is always advisable to test JAX Green Patina in a small inconspicuous area to make sure that it does not adversely affect or damage the surface being treated. For a more authentic look, first apply a JAX Darkener to the metal before applying the JAX Green Patina. 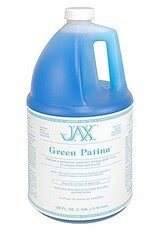 Do NOT apply JAX Green Patina to hot metal or roofs – the chemicals will simply evaporate and have little or no effect.